Working Title: Merry, Merry. Sorta. 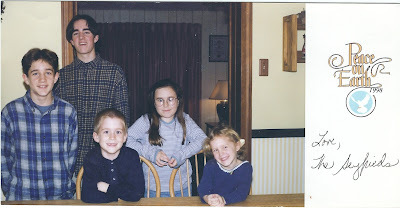 20 Christmases ago! They haven't changed a bit! In recent years, I have not set foot in a bricks-and-mortar store for a single Yuletide gift (between online options and Julie, my personal holiday shopper, there has been neither need nor desire to battle crowds). We still draw names for Secret Santa on Thanksgiving night, but it has become a slapdash event, with most of us quickly losing the slips of paper with our chosen names on them. Steve has taken it upon himself to record everyone’s choices, in case we forget who we picked, and most of us have to ask him for reminders (some of us, more than once). I’ve never been a big holiday house decorator, because all I can think of is how lengthy and painful un-decorating will be after New Year’s, but nowadays I am more of a minimalist than ever. This sorry state of affairs is ironic, because the whole reason all of this began was my disappointment with the lack of prep that occurred in the Cunningham house when I was growing up. Mom up in Heaven is probably having a little chuckle about this turn by her hyper-critical daughter. Yeah, yeah, have your laugh, Joanie! But at least I tried to create Holiday Magic! For YEARS! That’s gotta count for something! Which brings us to Christmas 2018, with Aiden and Peter in the mix, both of whom are now aware of things like Mr. Claus and other holly jolly accoutrements. We took some super cute pix of the boys recently, any one of which would look great on a card. There is also plenty of time (a whole week!) to resurrect stockings and St. Nicholas Day for my precious little guys. I think, if I can just catch my second wind, a lot of this can yet be pulled off! I just need to find my (outdated I’m sure) address book and some stamps, and buy some candy and toy cars and little books etc. for the stockings, and get the kids ornaments and….